A beautiful filly - bred and built to stay with a great turn of foot. 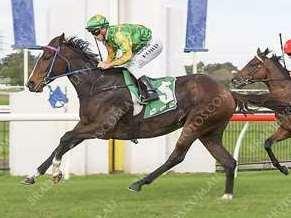 Her ETRAKKA readings indicate she is in the elite stayer class. She is having a good spell then will be back for summer and autumn racing. BERNARDINI (USA) (Bay 2003-Stud 2007). 6 wins from 1m to 1¼m, Pimlico Preakness S., Gr.1. Leading NZ Sire of 2YOs 2012-13. Sire of 1212 rnrs, 704 wnrs, 64 SW, inc. Alpha (Saratoga Travers S., Gr.1), Stay Thirsty, Cavorting, Ruud Awakening, Boban, To Honor and Serve, Dame Dorothy, Angela Renee, Go Indy Go, Takaful, Greenpointcrusader, Rachel's Valentina, A.Z. Warrior, Biondetti, Lewis Bay, Zanbagh, Le Bernardin, Toydini, Imperative, Gamilati, etc. Beseech (g. by Lonhro). 9 wins-1 at 2-to 1400m, A$152,375, BRC Harcourts Green Living H., SITA Australia Pty Ltd P., Programmed Property Services H., 2d BRC Ambassador Travel P.
Beg (f. by Iglesia). 3 wins-1 at 2-from 1250m to 1600m, A$133,522, ATC Chiko H., Rosehill Gardens Event Centre H., STC Members 2YO H., 2d AJC Spring Carnival Package on Sale 2YO H., ATC Fairfield RSL H., 3d AJC Schweppes 2YO H., STC Winning Post Restaurant H., MRC Ascend Sales H.
Suit (g. by Lonhro). 2 wins-1 at 2-at 1100m, 1200m, A$182,275, ATC Cellarbrations Peachtree Hotel H., Australian Turf Club 2YO P., 2d ATC Become an ATC Sponsor 2YO P., Theraces.com.au H., BRC Garrards Horse & Hound P., Cargo Transport Systems H., 3d ATC Rosehill Gardens H., BRC Sprite H., Hawkesbury RC Westaflex H.
So it Is (f. by Bernardini). 2 wins. See below. Adina Rose (f. by Ad Valorem). Winner at 1600m in 2017-18 in Aust. Sampeah (Exceed and Excel). Winner at 2, A$156,350, ATC Tab.com.au 2YO P., 2d ATC Sydney Markets Foundation H., Cafe Culture & Insitu H., Bayer H., 3d VRC Sires' Produce S., Gr.2, MRC Blue Diamond Prelude (c&g), Gr.3. Parthian (Lonhro). 8 wins to 1550m, A$438,960, AJC Schweppes H., VRC Millson & Nugent H., MRC Nadeem H., STC Jim Beam H., AJC Corporate Membership H., Randwick 150th Anniversary H., STC Grand Pavilion H., 2d MRC Anniversary Vase, L, ATC JB (Barry) Maher Memorial H., Blackwoods New Catalogue H., STC Bowermans Office Furniture H., AJC Sanders Noonan H., Yagoona H., Rising Fast H., 3d ATC Schweppes H., 4th STC Festival S., L.
Hassle (Zabeel). 8 wins-1 at 2-from 1300m to 1800m, A$358,445, AJC Emirates Airline H., VRC Vili's H., Scalzo Food Industries H., MRC Counsel H., AJC Nafda Best of the Best H., Kokoda 2YO H., Burwood H., 2d VRC RSL P., MRC Thoroughbred Club Cup H., Cole Diesel H., STC St Johns Park Bowling Club H., 3d STC Neville Sellwood S., L, VRC Heaven Extras H., STC Homeshop.com.au Welter H., AJC Spring H., STC Daily Telegraph H.
HELLO DARL (Metal Precieux). 3 wins at 2, A$278,150, VRC Bloodhorse Breeders' P., Gr.2, SAJC Queen Adelaide S., L, 2d STC Ranvet S., Gr.1, Coolmore Classic, Gr.1, AJC Light Fingers S., Gr.2, VATC Blue Diamond Prelude, Gr.3, STC Taronga Park H., 3d STC Ansett Australia S., Gr.1, 4th Australasian Oaks, Gr.1, SAJC Breeders' S., Gr.2, AJC Emancipation S., Gr.3, VATC Summoned S., L. Producer. BIG DAWN (Strategic). 6 wins at 1200m, 1400m, 320,644Rgt. in Malaysia, Penang TC Dr Lim Ah Soo Memorial Trophy, L, Da Ma Cai S., 2d Selangor TC Sports Toto 4YO Super Challenge Trophy, 3d Penang TC Open H.
Hi Precious (Metal Precieux). 2 wins. See above. Race Record: 15 Starts 2-1-2 A$56,110. 2 wins at 1400m, 2000m to 2017-18 in Aust.